Homing pigeons have been bred to be able to find their way home, almost no matter where they are released. They have been used for more than 2,500 years to deliver messages in a fast, reliable way. For example, a homing pigeon was used to deliver the results of the first Olympiad back in 776 BC.1 Because they have been used for such a long time, scientists have tried to figure out how pigeons are able to navigate their way from an unknown location back to their home. While scientists have been able to figure out some aspects of homing pigeon navigation, the details haven’t been entirely worked out. Over the years, several hypotheses have been put forth to explain why those pigeons never made it home. One of them suggests that the pigeons’ navigation was disrupted by the sonic boom of the Concorde jet whose flight path crossed that of pigeons. A recent study by Dr. Jonathan T. Hagstrum adds some support to this hypothesis. As a geophysicist, Hagstrum was intrigued by the idea that the Concorde jet might have disrupted the pigeons’ ability to navigate. He knew that the Concorde jet was a source of infrasound – sound waves that are well below the frequency that human ears can detect. Even though humans can’t detect them, many animals can. He knew that infrasound permeates most of the earth’s atmosphere, because it is produced by all manner of natural phenomena such as earthquakes, volcanoes, avalanches, severe weather, ocean waves, and meteors. Because of the way the sound waves interact with the land, this infrasound produces patterns that are characteristic of the terrain. He wondered if the birds were using these patterns to “see” the terrain and thus navigate back home. To find out if he was right, Hagstrum examined the release logs for pigeons that were raised at Cornell University in Ithaca, New York. They were regularly released from three locations in the state of New York, and they had no trouble finding their way home from two of them. However, one location (the Jersey Hill fire tower, 119 kilometers west of their home) proved very troublesome. Most pigeons that were released from that location never made it back. However, on one day (August 13, 1969) they all made it back from that location. 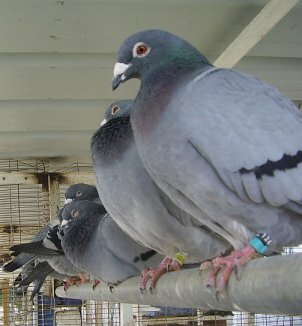 In other words, pigeons might be hearing a map that helps them figure out where they are and where they need to go! That’s incredible, isn’t it? Hagstrum suggests that other navigating animals might use infrasound maps as well, so there is probably a lot more to learn about this issue. What I find most fascinating about this is that pigeons obviously have a combination of senses that allow them to navigate. Scientists recently learned that salmon also use a combination of senses (smell and magnetic field) to find their way back home to reproduce. I suspect that as we learn more about migratory animals, we will find that they all have multiple means by which they navigate. After all, any well-designed system is going to have backups and failsafes so as to provide optimum performance under a variety of conditions. This is really cool, I find this stuff amazing. Especially considering that I’m learning about waves in school right now. Thanks for your comment, Stephanie. You might be interested to know that the shortest wavelengths for infrasound are about 17 meters (56 feet), while some natural infrasonic waves that have been studied have wavelengths of 344 kilometers (214 miles)! Homing pigeons are absolutely amazing. Scientists are still baffled by the fact that they can find their way home despite various disrupting circumstances. Have you ever read any of Rupert Sheldrake’s books? I recently read his “Dogs That Know When Their Owners Are Coming Home” and found most of it fascinating and he covers this pigeon phenomenon as well. Thanks for your comment, Zachary. I have not read any of those books, but I just added Dogs That Know When Their Owners Are Coming Home to my Amazon wishlist! Dr. Gish Dies at Age 92 Nature’s Farmers Are Pretty Smart!